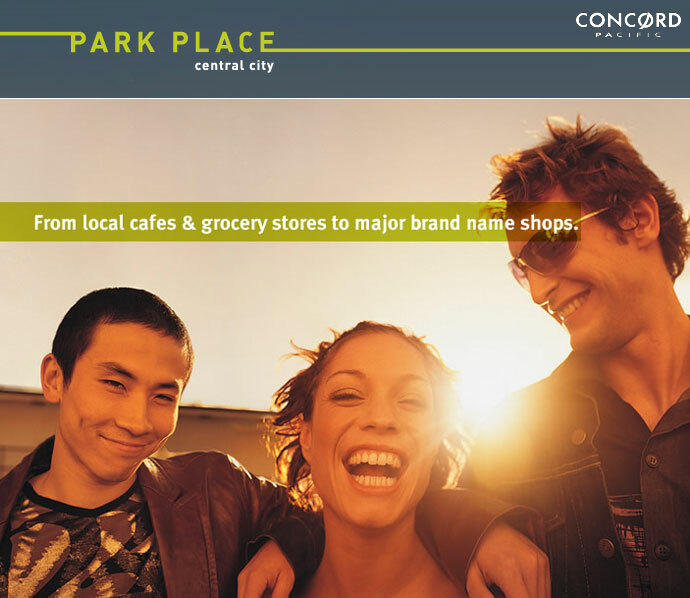 The Vancouver Condo Buzz » Concord Pacific’s PARK PLACE Surrey City Centre Condos Launching! Affordable Surrey Condominiums at Park Place Central City are Perfect for First Time Homebuyers, Families, Retirees & Investors! ONE Park Place Now 90% SOLD OUT – Launch of TWO Park Place! Concord Pacific’s PARK PLACE Surrey City Centre Condos Launching! Affordable Surrey Condominiums at Park Place Central City are Perfect for First Time Homebuyers, Families, Retirees & Investors! ONE Park Place Now 90% SOLD OUT – Launch of TWO Park Place! SALES CENTRE CLOSING OUT SALE at Park Place Surrey Condos! Adjacent to King George SkyTrain Station, Holland Park, 130 shops in Central City Mall as well as SFU Campus, the 900 unit Park Place Surrey condo project is the most desirable brand new address in the heart of the booming Surrey City Centre real estate market. The closing out sales event on June 23rd will offer you the best and last chance to own a luxuriously appointed new Surrey Park Place condo home from this renowned community. There are only 17 two bedroom homes between 766 sq. ft. to 844 sq. ft. available from $289,900 – $346,800 including net HST as well as over 10,000 sq. ft. of unparalleled amenities at Club Central at Park Place Surrey condo development with concierge services. Get significant additional savings and incentive options only on June 23rd and move in now to the new Surrey Park Place Condos in City Centre! ALERT: ONE PARK PLACE Surrey Condo Tower is now 90% SOLD OUT! Pre-registration for TWO PARK PLACE Surrey condos on now! Presales for the new Two Park Place Surrey Central City condo tower will begin in 2011. It’s the Phase 2 release at the master planned Park Place Surrey real estate development by Concord Pacific, and it’s also the highrise a bit closer to the SkyTrain station. The newest Surrey Central City real estate project is coming to town! The most amazing and outstanding project at Park Place Surrey Condos is brought to you by Concord Pacific, one of the most experienced and notable builders in the Greater Vancouver property market with decades of experience in building masterplanned condominium communities and featuring affordable opportunities to home buyers. The best priced concrete condo investment in the Lower Mainland is what the new Surrey Park Place Condos will provide. In addition, the Surrey Central City real estate master planned redevelopment includes a five billion dollar infrastructure budget with civic improvements in the next decade. Best of all, increased Surrey housing demand from more than four thousand new professional jobs (a good estimate) will make the new Park Place at Surrey Central City condo development a huge success! This project has it all! With Surrey booming, the affordable Surrey condos by Concord Pacific will certainly give you a number of great reasons to purchase a new home here including its ideal location and convenience to services. With a scheduled completion coming soon in late 2011, the new Park Place Surrey Central City condo tower by Concord Pacific will certainly be the most affordable and prestigious property development in the newly revitalized district. Connected to everything, the centrally located Park Place Surrey Condo tower will be surrounded by the newly designed Holland Park district, the new Central City Mall as well as the SkyTrain to take you throughout the Lower Mainland. Thousands of new jobs are being created in and around the Surrey Central City real estate district, and most of these are professional jobs too. Here are some of the massive improvements and projects happening in the Park Place Surrey Central City condo community: Chuck Baily Recreation Centre, Youth Park, King George Boulevard Revitalization, Surrey Central City Shopping Centre, Civic Centre Development Project, SFU Surrey Campus, T&T Grocery Store, Surrey Library, Holland Park, Surrey Tax Centre, Surrey Memorial Hospital, the new RCMP Headquarters and the SkytTrain that can take you to downtown Vancouver in 35 minutes. 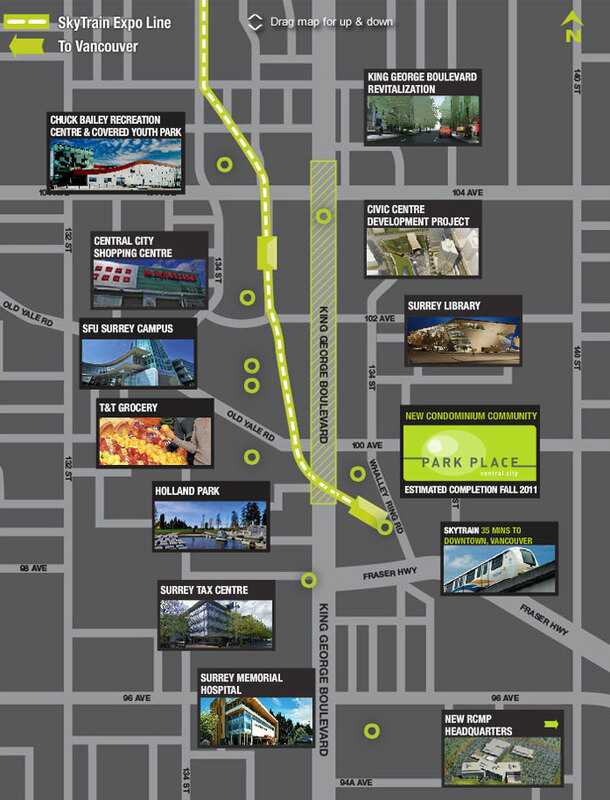 Surrey Park Place Central City condos will be central to all of this in addition to the local flavours, culture, recreational facilities, shopping and dining just steps away! Concord Pacific is the largest master builders in Canada focused in multi-family housing developments, and with their experience, the new Park Place Central City Condo development, homebuyers can expect to find affordability and high-end finishes in all suites. Are you looking for the best valued concrete condominium investment in Greater Vancouver? Well, the best Lower Mainland concrete condo investment is now here! Presenting concrete high-rise residences in the Central City Surrey real estate market, Park Place by Concord Pacific offers one bedroom suites from just $199,800. Yes, so less than $200,000 will get you into the market at a basement bargain price in one of the hottest Lower Mainland neighbourhoods. Coupled with solid concrete high-rise construction by Canada’s largest community builder in Concord Pacific Park Place Surrey condos will be part of an ever evolving community that will lead the way in innovation, creation of jobs, transportation hubs and entertainment options. More than five billion dollars are being spent in Surrey Central City Centre community on new infrastructure projects as well as civic centre improvements. Some of these include the new Central Surrey library. Not only that, but the new Park Place condo tower will be well situated in the Central City community that is expected to bring in over 1000 per month because of the addition of more than 4,000 new professional jobs into the area (quoted from several sources). Located next to great shopping and big box retailers in addition to services, Central City Surrey shops and the beautiful Holland Park, Park Place Surrey condos will also be connected via SkyTrain to YVR and downtown Vancouver with ease. For the second time in two years, Surrey real estate market ranks #2 in terms of investment in British Columbia, and the Surrey Central City development is leading the way! The project by Concord Pacific will also include Club Central that has a state of the art gym, theatre, indoor and outdoor lounge space, barbeque areas, billiards room and even a bowling alley. The residents at the Concord Pacific Park Place Surrey condos will also enjoy a 24/7 concierge and an impressive entrance lobby. Register today for an opportunity to own in the best value concrete investment in the Lower Mainland. Brought to you by Concord Pacific – Canada’s largest community builder. Get Ahead of the Line for VIP Sales at TWO PARK PLACE Surrey Condo Tower! With One Park Place now over 90% sold out, the VIP Sales Event for the new Two Park Place Surrey condo tower is upon us and set for November 27th, 2010! 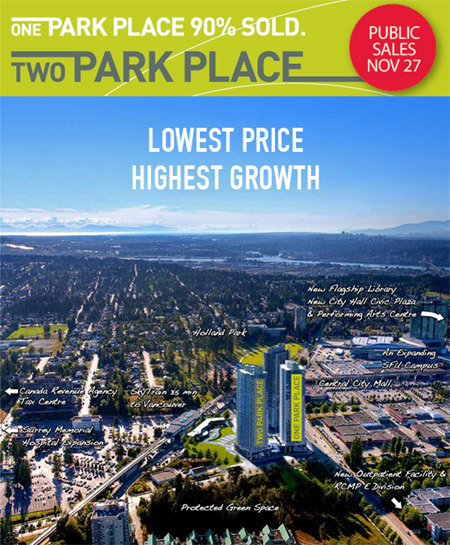 With the lowest presales condo pricing available in the Surrey City Centre real estate market plus the highest growth potential, the Two Park Place Surrey condos for sale is a great investment for yourself both short and long term. From the new flagship library, new City Hall Civic Plaza and Performing Arts Centre to the east to Holland Park to the north, the Two Park Place Surrey condos for sale are absolutely well located in the centre of it all. In addition, the Two Park Place Surrey City Centre condos fors ale are close to Central City Mall, an expanding SFU campus, new outpatient Facility and RCMP E Division headquarters in addition to protected green space and the Skytrain which takes you to downtown Vancouver in just 35 minutes. Also around the Surrey City Centre real estate community that is being revitalized right now is the Canada Revenue Agency Tax Centre as well as the Surrey Memorial Hospital Expansion. One Park Place condominium tower was a huge sales success. Hundreds of homebuyers got the Lower Mainland’s lowest priced concrete condos with the hightest potential for long term growth. Registration for Two Park Place Surrey condos at the end of November 2010 is happening right now, so please do not miss out on this awesome opportunity! For a limited time offer, the popular CHOICE REWARDS will be extended right here at the presales Park Place Surrey City Centre condo towers. Benefit from two fo the following three purchase options: HST Helper Discount, 2.5% 3 year fixed rate mortgage and/or two years free rental management for your Surrey condo investment. This is your BEST chance to GET AHEAD! TWO PARK PLACE Surrey condos in one bedroom floorplan layouts will start from $209,800 (with monthly mortgage from $705) while two bedroom condominiums start from just $269,800 (with monthly mortgage from $906). One Park Place Surrey condo tower was a huge sales success as hundreds of homebuyers snatched up the hundreds of units within a couple of weeks of its launch. The new Surrey City Centre real estate market is heating up, and the next launch at Two Park Place Surrey condo tower will be happening in November 2010! This is your time to get ahead with a sound and secure Surrey real estate investment that is ripe for huge rewards in the near future. The Two Park Place Surrey pre-sales condos will start from the low $200’s for the one bedroom suites and from just the mid $200,000 range for the spacious two bedroom units. The secret is definitely out of the bag, and the sophisticated twin towers at the Surrey Park Place real estate development is an ambitious project that will see the rise of over twenty two hundred suites in the Central City neighbourhood that is going through a massive revitalization project at the moment with new infrastructure, office buildings, retail and industry. Concord Pacific introduces the Park Place Surrey condominium towers and with an influx of more than 6,000 new full time professional jobs expected in the next few years, this is an investment of a lifetime says their sales and marketing team. The Surrey Memorial Hospital will be completed by 2013 while the new RCMP Division Headquarters is underway and will be completed by 2013 and create more than 2,700 new jobs into the new Surrey City Centre real estate district. In addition, the Surrey Civic Centre will be complete by 2013 and the SFU campus is right next to the new Surrey Park Place condos for sale. What makes this an attractive Surrey real estate investment is that there are many housing types within the area, which promotes diversity and selection for homebuyers. Park Place Surrey City Centre real estate development is an ideal place for both homebuyers as well as investors for the long run and with two bedroom suites on the 34th floor with amazing views priced from less than $300,000’s, what are you waiting for? This is the best value concrete condominium tower in all of the Greater Vancouver area and the Park Place Surrey condos will introduce on site amenities that include a club style 10,000 square foot podium level fitness facility, expansive outdoor entertainment areas, kitchen, games room, billiards room, steam rooms, theatre/media room, gym, and Pilates area. There is even a full sized bowling alley on site. The pre-construction Surrey Park Place presentation centre is now open and located at 9886 Whalley Boulevard Surrey. The Concord Pacific Surrey real estate development at ONE PARK PLACE (Phase 1 release) is now 90% SOLD OUT! Here is what happy homebuyer are saying: I bought because of the One Park Place Surrey condo pricing, Holland Park, concierge service and club amenities. I work at Surrey Memorial Hospital and I bought for the convenient location. I can walk to work! I’ll be working next door at the New City Hall and will be able to get downtown Vancouver within 35 minutes on the SkyTrain from Park Place Surrey community. New infrastructure like the Port Mann Twinning and Civic Centre make this a prime Surrey real estate investment for me. I bought because I teach at SFU, and big box retail and Central City Mall are next door to my new home at One Park Place Surrey City Central condos for sale. We bought for our son. He goes to SFU across King George. It’s a Surrey real estate investment in his future. Rent or resale, it’s a no brainer with demand from a thousand new people every month into Surrey City Centre community. No more wood frame construction! With experience throughout North America, namely in Vancouver and Toronto, Concord Pacific now embarks on another ambitious residential project, but this time in Central City Surrey real estate market. Called the Park Place Central City Condos in the heart of Surrey, the fastest growing city in Canada, these condominiums will become one of the best Surrey real estate developments for both homebuyers and investors who believe in the future of this great community. The condominium tower will feature almost seven hundred new home and add much required housing stock and affordable suites for the area that is expecting a huge influx of people because of the increase in jobs and great economy. The best Surrey real estate investment is certainly at Park Place Central City condos and will consist of two high-rise towers with contemporary design. Featured within the new Holland Park district, the homes will be part of the master planned City Centre area with it’s huge city upgrades and infrastructure projects well underway already. With potential for huge capital growth for homebuyers in addition to great cash flow properties for investors, the best Surrey real estate investment opportunity is now upon us. Concord Pacific presents the Park Place Central City Surrey condos that have efficient floor plans, competitive and affordable price points and magnificent interiors. In addition, because of the Holland Park location, the high-rise towers will have incredible three hundred and sixty degree views of the Lower Mainland. Some of the most incredible on site features and amenities right at Park Place Surrey condos for sale include podium level amenities such as a clubhouse lounge and catering kitchen in addition to a barbeque area. On the main level, you will find a bowling alley, movie/screening room, steam room, change rooms, fitness centre, yoga/pilates room, bike repair area, meeting rooms and a games room with billiards table. The Club Central amenities at Park Place will give residents year round excitement, relaxation space and entertainment areas. These are some of the initial interior features that are presented on the Park Place Surrey City Centre condo website that are subject to change. The interiors of these impressive condominiums will include in suite laundry with stacked washer and dryer in addition to horizontal blinds for privacy and laminate floors in the living areas (in two palettes that buyers can choose from). In addition, there will be contemporary low-pile carpets in the bedrooms in addition to large entertainment sized outdoor living spaces as per plans. The new Surrey City Centre condos for sale will also include expansive windows and Wenge or Oak colour schemes. Some of the upgrade options for homebuyers include limestone or marble counters in the baths and stainless steel appliance set. The kitchens at the Park Place by Concord Pacific Surrey City Centre condos for sale will include a black or white appliance package with microwave and double bowl stainless steel sink. Other interiors include Corian kitchen counters, porcelain (mosaic style) backsplash, porcelain tiled floors, chrome levers and aluminum framed Oak or Wenge laminate cabinetry (some with frosted doors). The ensuite baths will include large format porcelain tiles, ceramic tiled in the shower surround, mirror, soaker tubs, drop in sink, laminate counters (unless upgraded) and again the same choice of laminate cabinetry. The main bathrooms will have similar high-end features as well with the optional upgrades. Overall, the Park Place Surrey City Centre condos for sale will be priced very affordably for the finishes that are standard in the suite, and will add to the resale value and potential for positive cash flow when complete. As mentioned above, the Surrey Park Place condo development will include two high-rise towers built by Concord Pacific developers. Most of the Park Place floor plans are presented in both towers with varying exposures, so there is a great selection of layouts for homebuyers. The Surrey Park Place condo floor plans include Suites 01 + 10 which is a five hundred and twenty nine square foot unit with 50sf balcony and 1 bathroom (1 bed). Suites 05 + 06 at the Park Place Surrey condos for sale are 577sf 1 bed and 1 bath units on floors 2 – 36 with 50 to 76 square foot balconies (in both condominium high-rises). The larger Surrey Park Place floor plans is Suites 04 + 07 which are 2 bedroom plus work station and 2 full bath units at 899 square feet in size. The varying floor plans and exposures (corner suites) have balconies between 110 to 512 sq footage for total areas of over 1000sf). The Suite 03 + 08 Surrey Park Place floor plans are 2 bed and 1.5 bathroom units at 766 square feet with varying balcony sizes between 52 to 116 sqft and are middle suites facing west and east. Last but not least are Suites 02 + 09 at the Park Place Surrey City Centre condo floor plans with sizes between 844-849sf and balconies from 36 to 825 square footage! Yes, that is eight hundred and twenty five square feet of outdoor entertainment space just for you! The layout is 2 bedrooms and 2 bathrooms. The Surrey City Centre Real Estate Development Presentation Centre is coming soon. In the meantime, if you would like more information about the Central City Park Place Surrey City Centre condos by Concord Pacific, please visit their sales centre at 88 Pacific Blvd, Vancouver BC (Pacific at Carrall). They are open daily from 10am to 5pm and you can call 604.899.8800. Alternatively, the website is now online and located at www.parkplaceliving.ca.